WINTER PROMOTION !! COMPLIMENTARY POOL HEAT ON MIN. 7 NIGHT STAY !! Take advantage of our Winter Promotion we are currently offering complimentary pool heat for any minimum 7 night stay from January to end of April. Professionally furnished and decorated to the highest standards, our home will make your stay with us as memorable and comfortable as your own home. Our extended deck with no rear neighbors is a true paradise for your vacation !! Beautifully appointed and furnished bedrooms with the added luxury of euro pillow top mattresses that help to ensure a good night sleep after a day at the parks and shopping. Our newly renovated open concept kitchen with new cabinets, counter tops and new stainless steel appliances should you want to cook rather than eat out. Our living and dining area are central in an open concept lay out featuring vaulted ceiling complimenting the luxurious feeling of our vacation home. We have free long distance and WIFI available for all our guests during their stay. We have installed new television though out the home and we have provided a tv in every room . Our villa has a private south facing pool with no rear neighbors. Our home backs onto a privacy wall and beyond that, large palm trees enhancing the tropical atmosphere with an extended six foot deck beyond the pool area with a large patio table for you to enjoy dining al fresco during your stay. Our home has its own private kidney shape pool and hot tub for you to unwind and relax durng your vacation. The entire area is screened in to ensure your comfort and protection from insects.. We have a child proof fence for the pool area. - Private Yard with Large Pool and Spa. - Three and a half Bathrooms - One Accessible by the Pool Area. - X box game system with games. - Professionally Decorated and Furnished. - Big screen TV, DVD, VCR and Stereo. - Master with Soak er Tub and Shower Stall. -24/7 Management company to ensure your comfort. The fantastic new resort-style gated community of Windsor Palms is ideally located just three miles from the Disney entrance. All guests of our six bedroom home have access to the all our resort facilities at no additional costs. Whether you're in Florida for the various attractions or simply to relax, Windsor Palms is the perfect location for the whole family to enjoy. 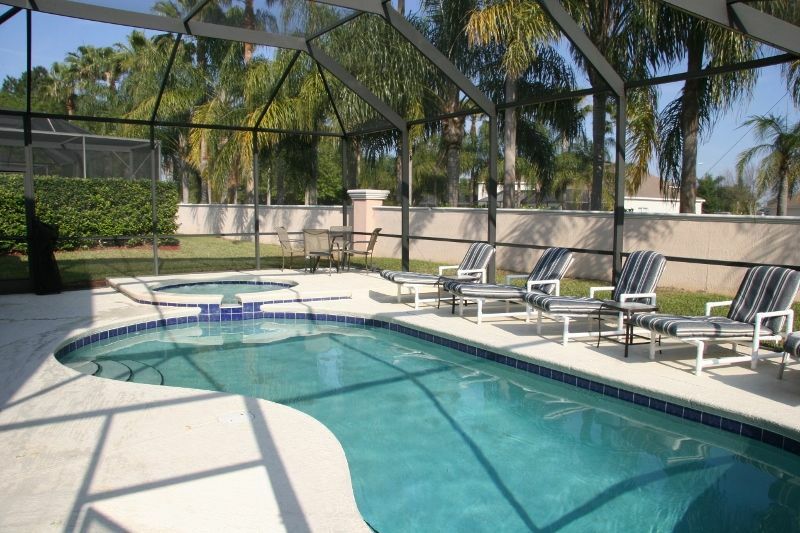 Windsor Palms Resort homes are available on a short term rental basis. -Security Guard on Duty 24/7. -Shuttle Service to Area Attractions. We are Canadians who rented for two years at Windsor Palm Resort and could not believe that a place like this actually existed. What a concept to have the best of both worlds to be able to enjoy the parks and then unwind and relax in the comforts of a home. To have the luxury of a home away from home at an incredible luxury resort with more amenities that you can imagine so close to Disney and all the parks available in Orlando. We just loved the resort community. We felt so incredibly safe in this gated community, so after renting for a number of years, we realized this would hopefully one day be a place we could retire at. We love having the comforts of home away from home. Having our own private pool. Being in a a gated community and having the amenities at the clubhouse like the volley ball courts, work out facility, theatre and sundry shop. I am so pleased with the management and the level of service at the clubhouse and taking care of everyone of our guests. If you are the kind of person who needs some downtime after spending 12+ hours at Magic Kingdom, I highly recommend this approach. It was so nice to have an entire place to ourselves after crowds and lineups all day. It fully recharged us at the end of the day and we had plenty of energy for our next adventures. We loved Cathy's place - the hot tub soak at the end of a long day was perfect for the adults while the children swam in the pool. We had our family of four plus three grandparents, and we didn't even use two of the bedrooms. Everything was clean and comfortable and really close to the parks. If we ever come back to Disney with family or friends, we will definitely book this house again! Cathy was available when we had any questions, and even provided great tips on where to eat or shop. Overall, a wonderful experience. We had an amazing stay. The house was even better than in the pictures. The beds were all very comfortable, they had everything we needed in the kitchen, plenty of towels for the pool. The heated pool was excellent. I would strongly recommend booking this home for your vacation. Wonderful home for a family vacation for 8! We spent a week at this lovely home - 5 adults and 3 children. It was perfect. This home is incredibly convenient to Disney parks and restaurants. We loved the pool area. There was plenty of seating and room for everyone. Our only complaint is that we weren't able to stay longer! It was our pleasure to have you and your Family enjoy time at our home at Windsor Palm Resort. We are so pleased to hear how much you enjoyed your stay. All the Best to you and your Family and we hope to accommodate you on your next trip to Orlando. Everything was great for our first VRBO experience. A very nice home, comfortable beds, plenty of room and convenient location. We will be back again! Excellent family vacation home. Everyone in our family enjoyed the stay. The house was very comfortable, clean, updated and quiet. We had everything we needed. We had a relaxing stay and unforgettable family memories. We stayed May29th-June3rd. The house was perfect for us, group of 6. Everyone was able to have their own bedroom. Furnishings were great. We love sitting out first thing in the morning with our coffee, Whether in the lounge chairs or at the outdoor table. We spent the majority of our time outside at the pool area! This was my second time at Windsor Palms. It is a great area to stay, close to everything. We did indeed see the fireworks from the backyard!